Libby on the Label: #52 Ancestors Week 39 - "On the Farm"
#52 Ancestors Week 39 - "On the Farm"
Like most people, there are a lot of farmers in my tree. My mother grew up on a farm. The first farmer that came to mind was my mother's nephew Leroy ( he is one year younger than her, so was more like an uncle to me). I remember visiting their farm as a child. He was also an inventor and had several patents. He actually sold one of his inventions to John Deere which was quite profitable. More on that later when I post about their family in more detail. 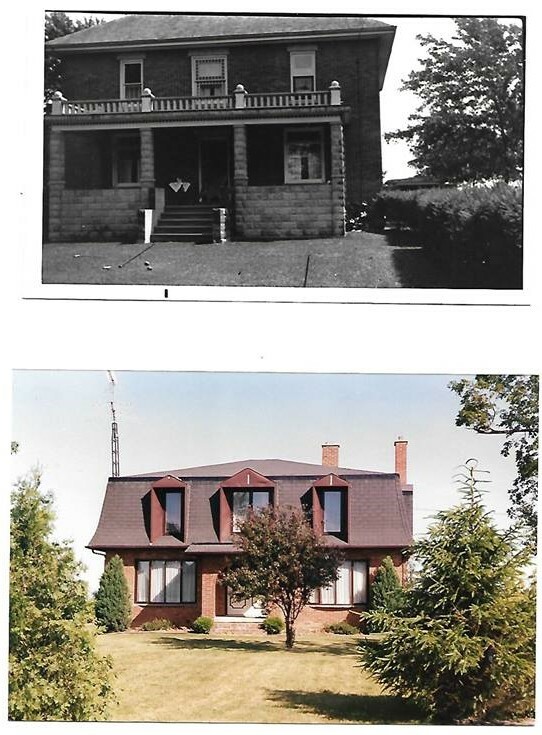 The photo here is their old farm house in Ontario - then and now. When my cousins lived there it was kind of in between the two pictures. It's a lot different, and is currently a solar farm. I got these photos from a distant Campbell cousin in Toronto whose grandfather built and later sold the farm to my uncle. The farming ancestor I want to mention this week is from Markham, Ontario. He could have been the subject of last week's prompt, "unusual sources", which is why he is comes to mind. There are two families who immigrated from the colonial United States to Markham and became very connected. They are the Marrs and the Buttons. A Marr son married a Button daughter, my 3rd great grandparents. In that same family a Button son married a Marr daughter, thus creating some confusing progeny with the names _______ Marr Button and ________ Button Marr. My 2nd great grandfather is Francis Button Marr, for example. There is also a Francis Marr Button. William Marr Button (1816 - 1908) is the son of Annie Marr and Colonel Francis Button, making him my 1st cousin 4 x removed. He was their eldest son and the grandson of Major John Button. The Button family developed the hamlet of Buttonville, Ontario giving it its name. William Marr Button like his father and grandfather was involved in the militia, participating in the 1837 Rebellion on the side of the Family Compact as well as in the Fenian Raids. He attained the rank of Colonel. He married Margaret Arnold and together they had eight daughters. They were farmers with several different parcels of land. Their daughter Meribah married Benjamin Hagerman who took over the farm for generations to come.